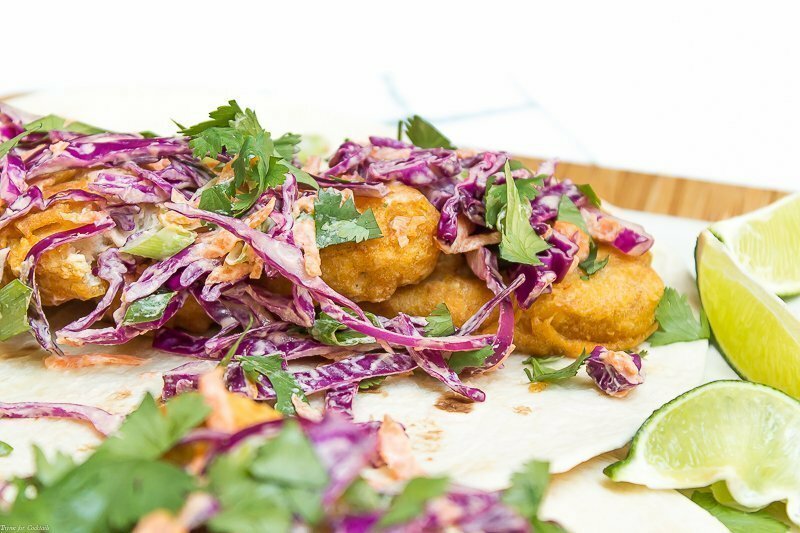 Faux Fish Tacos will have you rethinking your next craving for the ‘catch-of-the-day’! 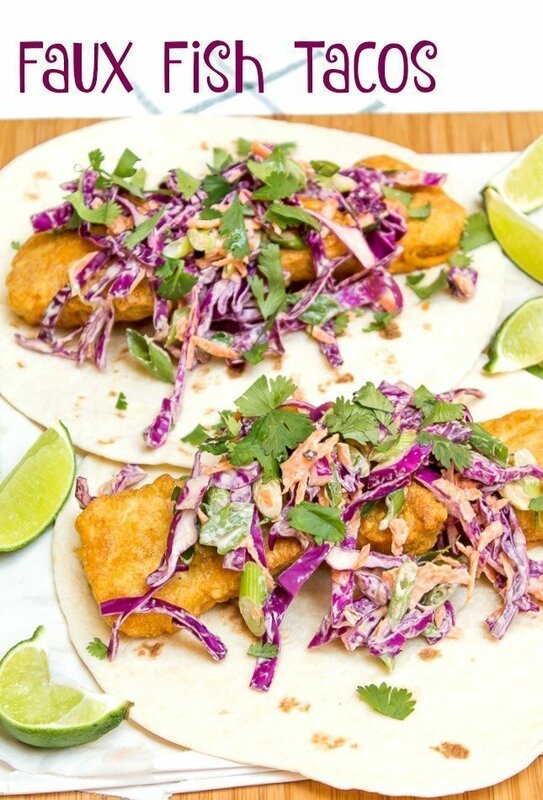 Crispy breaded fishless fillets and creamy chipotle cabbage slaw wrapped up in a soft flour tortilla. You should have seen Paul’s expression last night when I described this recipe to him. It was deadpan, barely disguised mistrust. ‘What is this fishless filet you speak of?’ was his response… [bctt tweet=”Faux Fish Tacos #meatless #catchoftheday #tacoTuesday” username=”thyme4cocktails”] And you know what? Less than 30 minutes later he was stuffing his (big obnoxious) mouth with Faux Fish Tacos! I have been using more meatless options in recipes to help lighten things up around the casa kitchen. 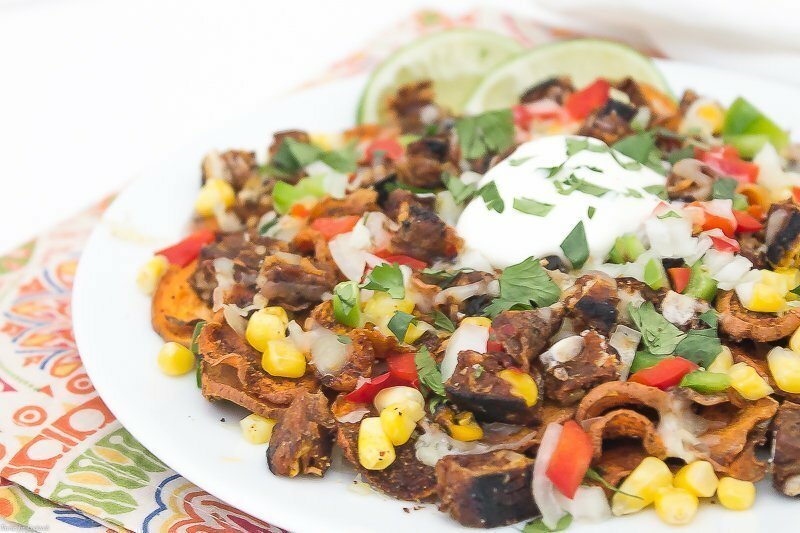 You should see the Loaded Sweet Potato Nachos we had recently! Homemade sweet potato chips topped with crumbled chipotle black bean burger, pepper jack queso and tons of veggies! 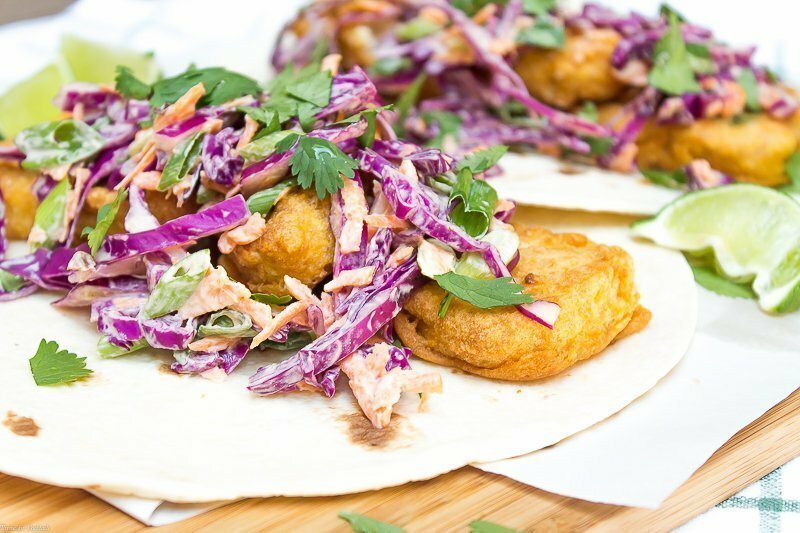 Faux Fish Tacos will have you rethinking your next craving for the 'catch-of-the-day'! 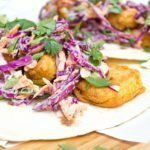 Breaded fishless fillets and creamy chipotle cabbage slaw wrapped up in a soft flour tortilla. In a large bowl whisk together Greek yogurt, sour cream, lime juice and adobo sauce. Sweeten as desired, salt and pepper to taste. Add cabbage, carrots and scallions toss to coat throughly. Prepare filets and tortillas according to package directions. Evenly divide filets between tortillas, top with cabbage mixture. Garnish with cilantro and a squeeze of lime juice if desired. I think they look just delicious!! I’ve been trying to lighten things up too – what a great option! !